Finding someone’s latest Will on their death continues to cause serious problems for the Executors who have been appointed to administer the Estate. The problem is that around half the Wills made, simply cannot be found! This effectively means that there is no Will, and the rules on intestacy (dying without a Will) are applied – therefore not reflecting the deceased’s wishes. Many Wills are also rejected by the Probate Office because the document has been damaged or torn, has staple holes, is partially burned, or has been scribbled on – all of which suggest there may have been a deliberate attempt to destroy or alter the original Will. Furthermore, the Will may have been deliberately removed and destroyed by a beneficiary who was not happy with the contents of it, and who may fair better under the intestacy rules. Fire, Flood and Theft: If your home is subject to fire, flood or burglary, your Will is seriously at risk – if it is lost or damaged, then you will no longer have a Will, and this has the effect of you dying “intestate”. Accidental Damage or Defacing: Wills can be successfully contested even if they have a small tear or marks on them. Holes made by staples, pins or paperclips; as well as a young child’s scribbling could all cause the Will to be invalidated by the courts. Deterioration: Your Will may need to last for many years. Accordingly it should be kept under the correct light, humidity and temperature conditions. Inability to Find: Your Executors must be able to take possession of your Will on death. If your Will is left in your home, your Executors may not be the first to discover the document, and if those getting there first don’t like your instructions, the Will could be removed or destroyed – thus effectively leaving your affairs as if you hadn’t made a Will. Is it your LATEST Will? : It is very important that your Executors know where to find your latest Will. Hunting around your house on death adds to the frustration at a stressful time, and if an earlier Will is found, the chances are your Executors will assume it is the latest one and stop searching. Solicitors: Solicitors practices are often subject to retirement, amalgamation or closure, and your Executor may have difficulty in locating or tracing your Will – it may even be lost in transfer. Banks: If your Will is kept in a bank safety deposit box, it’s likely that a court order would be required to get to it. 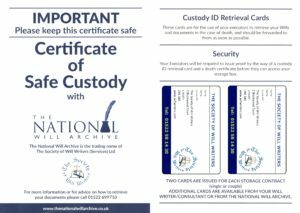 So it is important to ensure that not only is your Will safe – but it is also accessible. What does an Abbey Wills Storage package provide?